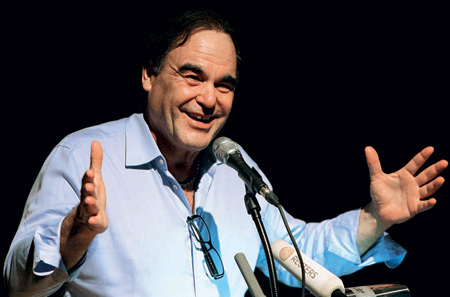 It was clear as soon as filmmaker Oliver Stone began to address the Foreign Correspondent’s Club of Thailand (on filmmaking and peace-building as part of “Bridges: Dialogues towards a culture of peace”) that the evening was not going to be a preach-fest, doling out impossible solutions – this was an idea exchange. It’s easy to be cynical about the future, Stone told us. When I met the celebrated director over breakfast the next day, I realised was the polar opposite of cynical and that throughout his life, as an English teacher in Vietnam, a war veteran and a filmmaker, he has remained full of hope, optimism and positivity. “I think through all my travels I’ve seen a commonality in all people; as different as we are, we have certain basic needs, and people do have a heart. There are always some ignorant and mean people, but I truly believe that the world is populated with good people.” It is this conviction that keeps Stone going and is probably why he found himself halfway across the world, honouring his commitments to “Bridges” while he battled with his manic schedule, taking time off from shooting the much-anticipated Wall Street 2, inspired by the 2008’s financial meltdown in the US, as well as a 10-part mini-series, Oliver Stone’s Secret History of America. Stone’s own film have been testament to his strong beliefs and personal encounters, “I was always a story teller,” he admits; at 19 he wrote his first book, but it was never published. After fighting in Vietnam, he returned to the US to study film and learnt to tell his stories in a different way. According to Stone, everything in life has a narrative and a filmmaker is fortunate to have the luxury of time to observe, understand and edit patterns of human behavior before turning them into a movie. “when you become an older filmmaker you have different interests, you try to sum up and say things that really matter to you.” And while he can’t define it, Stone hopes to one day make a film on the nuances of living – capturing its very texture. His distinguished list of films include Academy Award-winning Platoon and Born on the Fourth of July, both of which were based on the Vietnam War. Other prominent movies-with-a-message include Natural Born Killers, Heaven and Earth and the recent W, based on former US President, Georges W Bush. “I thank god I have been able to make films that I always wanted.” says Stone, who has often encountered much controversy for his work. Never undeterred, he calls it a categorisation that he has come to accept. ‘Bridges’ – Dialogues towards a Culture of Peace is organised by The International Peace Foundation, a non-religious, non-political group headquartered in Vienna, with 21 Nobel Laureates supporting its cause. The event started its tour of Thailand, Cambodia and the Philippines in November 2009 and will continue until April 2010. Vladimir Ashkenazy (piano), Dimitri Ashkenazy (clarinet) and Vovka Ashkenazy (piano), take part in a concert for a culture of peace. Professor Francis Barre-Sinoussi (Nobel Prize for Medicine, 2008) on the future challenges in HIV/AIDS prevention and therapy. President of Timor Leste, Dr Jose Ramos-Horta (Nobel Peace Prize Laureate, 1996).